Hey guys! 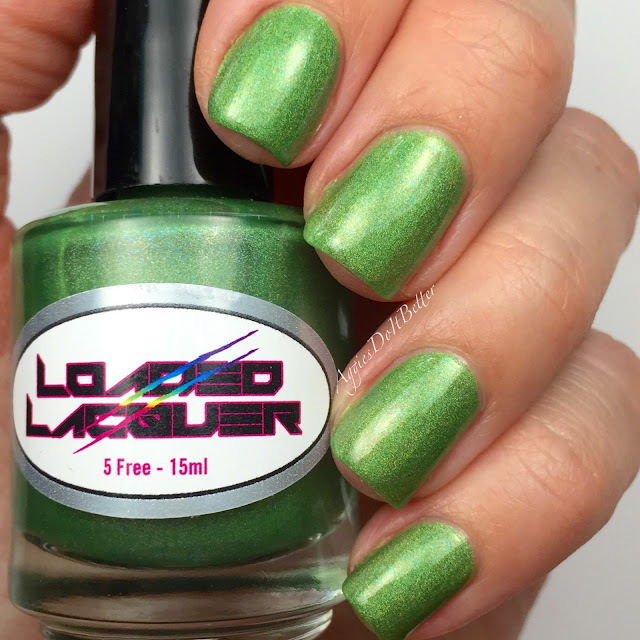 Today I have Heather of Loaded Lacquer's newest release. Well, half of it! 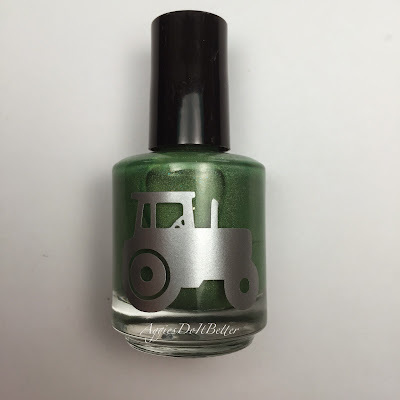 She released a tractor-and-beer "Dirt Road" duo and I just had to have this one! The other polish is more of an orangy coppery flaky glittery bit and it's just not my cup of tea. (you can see it here) But this one....hoooo boy. 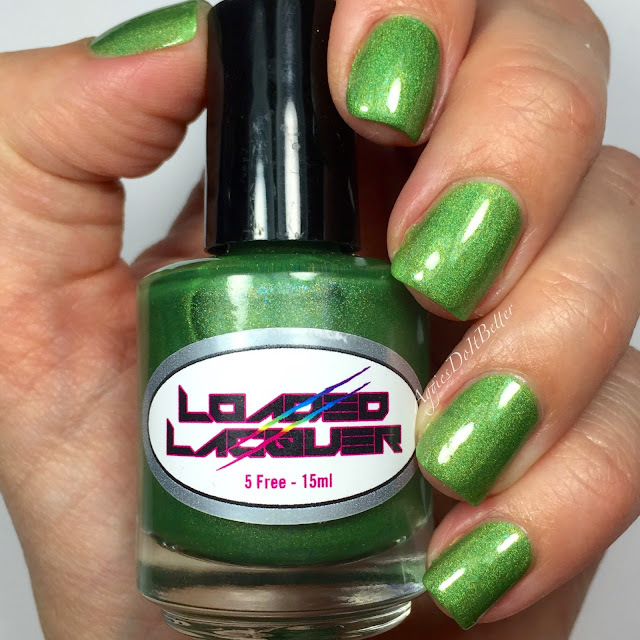 Its a bright grassy green with turquoise shimmer running through it. 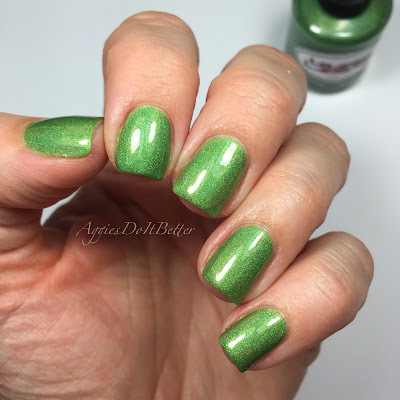 Not being a SUPER fan of shimmers I was surprised how strongly I felt about this polish! IT'S GORGEOUS LOOK A THE PICTURES NOW. On the back of the bottles look a the cute decal! This polish was thinner than I expected but I still got away with 2 coats. 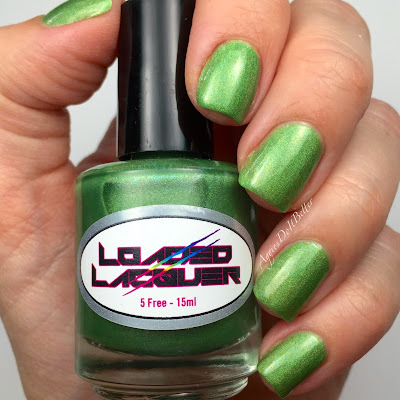 If you usually do super thin coats then you will probably need 3. I did add topcoat to this mani. Here's a couple pictures with out my super high tech super fancy filter I put on my lights. What do yall think of these pics? I really like a filtered light on my old lady skin, but the pictures are definitely more crisp with out it. When I feel like my skin is finally moisturized again I might start taking more pictures with out it.